Situated in the shadows of Shoreditch, The Queen of Hoxton boasts the best interior designs, from the UK’s most talented artists. Outside the venue a spray-painted sign reads on the door: ‘Welcome to the Queen of Hoxton, a youth club for adults’. Pink graffiti-style drawings adorn the sides of the building, and you can tell from the outset that this bar does not contain a single trace of magnolia paint. 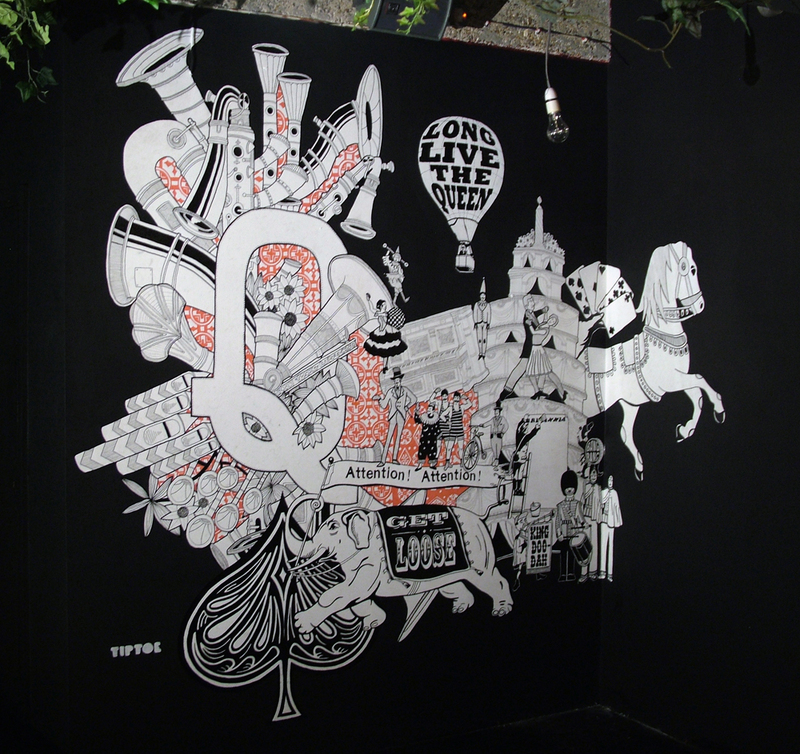 As part of their first birthday celebrations, The Queen of Hoxton ran an online competition asking various artists throughout the UK to put forward their ideas to illustrate throughout the venue. A complete re-vamp ensued, resulting in customers stepping into an artistic space, making it so much more than your typical East-End pub. 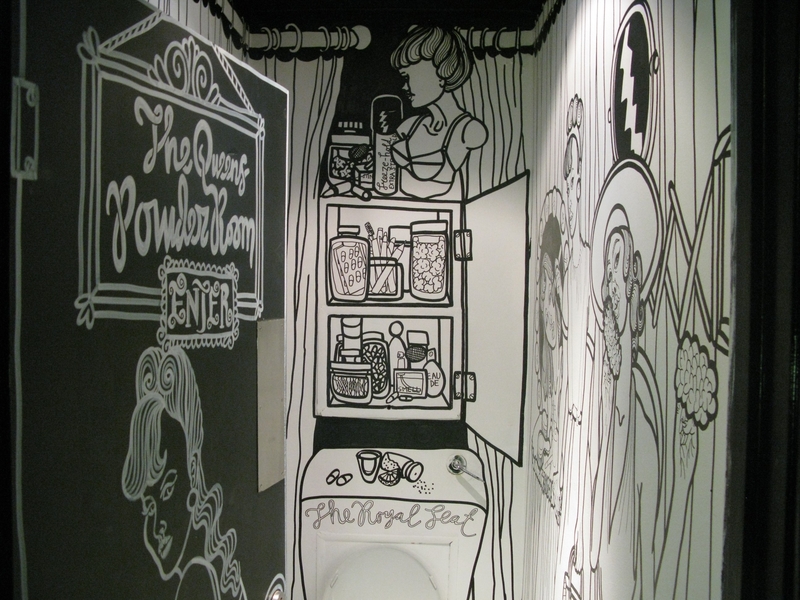 I wanted to do queens from past and present, and I really wanted to do the female toilets because I liked the fact they were a bit grotty. Eventually, it evolved into a boudoir scene” she said. On the Ground floor, a large-scale installation by Tiptoe Collective’s Mark Whittle, James Nicholls and Ian Caulkett infuses colours that give the feeling of a frantic, yet wonderful runaway circus. “We have never doubted that we have the ability to work in the creative industry; it’s just having the determination to keep going” said Ian. We draw inspiration from pop art, Warhol, Caulfield, right through to the way Banksy has made the medium his own. But there are some great contemporaries out there, Blu for instance. The creative process for any artist is individual in itself. English Socialist Graham Wallas presented one of the first models of the creative process in his 1926, work the “Art of thought”. In this, he outlined that the process involved five stages: preparation, incubation, imitation, illumination and verification. Explaining their personal steps towards the creative process, Ian said: “When a project first comes in we tend to sit there and look at each other for a bit, waiting for an idea to form, which never seems to happen. An idea usually hits us when we least expect it, from which point on, generally speaking, we’re all on the same wavelength” he said. When asked if they have any advice they would like to give to young artists, Ian said: “Don’t forget your paintbrush.” The Queen of Hoxton, although youthful in age, serves as a canvas for the showcasing of the best talent in Great Britain. So, the next time you visit this club, remember the names, you might just see them at the next Tate exhibition.